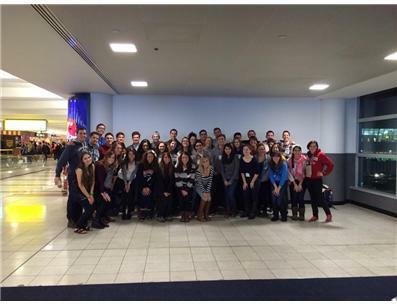 Northeastern Hillel believes in the power of relationships to transform Jewish lives. With a focus on relationships and not on participation, Northeastern Hillel creates vibrant, relevant, Jewish life across campus. We are interested in enhancing the accessibility of Jewish experiences for students as they first arrive on campus through conversations with their peers. The First Year Engagement Initiative will employ a cohort of students (engagement fellows) with broad social networks to build relationships with uninvolved Jewish first-year students over the course of the year. Each engagement fellow will be charged with building relationships with uninvolved Jewish students on campus. Serving as a resource to meaningful opportunities, the fellows will strive to advance Jewish values in the context of their relationships. Their goal will be striving to understand students' interests, passions, and aspirations – and connect them to opportunities that they may find meaningful and engaging. Engagement fellows will be given a budget to plan initiatives that they identify as relevant and Jewish, enable them to meet uninvolved Jewish students and follow-up with them in an authentic, comfortable, and open way. We anticipate that this new initiative will provide on-going relationship-building, especially as follow-up to immersive and meaningful experiences such as Alternative Break trips. Please help us invest in our student leaders by laying the groundwork on campus that will give them the skills to create accessible Jewish experiences with and for their post-college communities. We understand that the success of this initiative depends upon deep and meaningful supervision. The staff of Northeastern Hillel, including Northeastern University’s Jewish Spiritual Advisor, Engagement Director, Israel Coordinator and Executive Director (a Jewish Organizing Initiative-trained community organizer) will each play a role in mentoring and teaching the interns. Northeastern Hillel was established in 1962, by dedicated alumni who wanted to create a space for Jewish students to socialize and give back to the community through volunteer and community service initiatives. In 1978, Hillel moved into a newly renovated building at 456 Parker Street and a greater focus on Jewish religious and ritual life ensued. In 2001, Northeastern Hillel moved into its current location at 70 St. Stephen Street, focused on creating dynamic Jewish programs to bring students through the doors to “do Jewish.” Today, NU Hillel engages Jewish students where they are—spiritually and geographically-- creating meaningful Jewish experiences within their existing networks, helping to pave the way to expand and enhance their Jewish journeys. Northeastern Hillel enriches the lives of Jewish undergraduate and graduate students so that they may enrich the Jewish people and the world. Hillel student leaders, professionals and lay leaders are dedicated to creating a pluralistic, welcoming and inclusive environment for Jewish college students, where they are encouraged to grow intellectually, spiritually and socially. Hillel helps students find a balance in being distinctively Jewish and universally human by encouraging them to pursue Torah (Jewish learning), Avodah (Service) and Gemilut Chasadim (Acts of loving-kindness), and to support Israel and global Jewish peoplehood. 2) Welcome incoming Jewish students through welcome events and welcome packets. Northeastern Hillel is constantly innovating. We experiment with new programs on a small-scale first, measuring the success of our first ventures. We learn from doing. If an experiment has been meaningful, impactful, and the students are enthusiastic about it, we refine and scale it up together. If an experiment was not successful, we reflect upon why it wasn’t, consider it a learning experience, and try, try again. (Students also document each program through the completion of a program evaluation form after events so that we can learn from our past experiences.) We teach students not to fear failure, and encourage them to risk greatness. If we’re not making any mistakes along the way, chances are that we’re not challenging ourselves enough. We are linked with a university that places a strong emphasis on innovation and excellence. Accordingly, we always want to be learning, growing, and leading with students’ interests and passions. Others in the field have staff-initiated programs that they then set about trying to market to student leaders, selling them a “product.” Our innovative, student-centered approach sets us apart. We believe each person who walks through the door brings a fresh opportunity to shape the organization from within. Students identify the programming themes for the year and brainstorm, build, and run the programs, working through our 32-student strong student board as well as through the leadership of unaffiliated Northeastern students. Students run the board meetings, decide on the initiatives undertaken, and make them happen. Program staff assist students in thinking through strategy by asking questions, encouraging students to come up with the answers. Staff at Northeastern Hillel serve a role generally more typical of consultants, coaches, facilitators, and cheerleaders. We honor the knowledge and know-how that the students walk through the door with, and give them the Jewish education, resources, and connections to help them succeed. We teach them, but they teach us too. It’s truly a partnership. You have the power to shift the way that we engage the next generation of Jewish leaders—respecting that they have something unique and worthwhile to contribute NOW. Together we can change the Jewish future, one student at a time. And it all begins with your gift! This fall, Northeastern Hillel welcomed our award-winning Jewish Artist-in-Residence to Northeastern Hillel: Matti Kovler. In addition to serving Northeastern’s Jewish community, Matti has additionally engaged Jewish students from the nearby Berklee College of Music, Boston Conservatory, and New England Conservatory of Music for this special initiative. On November 25th, hundreds of students and administrators gathered to celebrate the release of a new Channukah song with Northeastern Hillel. The song, entitled “Suf-Ga-Ni-Ya” was based on a tune by Israeli singer Noa, and adapted by composer Matti Kovler, Jewish Music Theater’s Artistic Director and Northeastern Hillel’s Artist-in-Residence. Hillel is proud that through its celebration, it was able to give body to President Aoun’s words. There are many individual events/projects that would be a great fit for partnering with youth i.e. 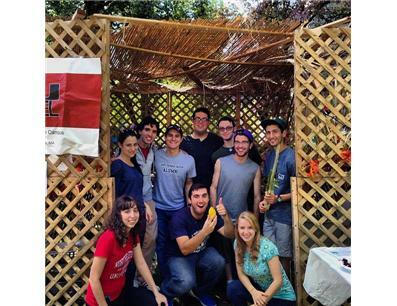 decorating the campus sukkah together, enjoying a meal in the sukkah together, doing a canned food drive using the sukkah as a central gathering area, etc. Please contact us to explore the potential to collaborate on an event together on a topic of mutual interest—i.e. environment, Jewish holidays, tzedek project, etc. You can view some of our existing events on our website and FB page. Our events are driven by our students’ interests and passions and we welcome opportunities for collaboration, and your participation! Northeastern Hillel sends more students to Israel on free trips through Taglit-Birthright Israel than any other campus in New England, per size of our Jewish population.